Fire blight is a devastating bacterial disease that can infect flowers, current year shoots, and the rootstock of apple trees. 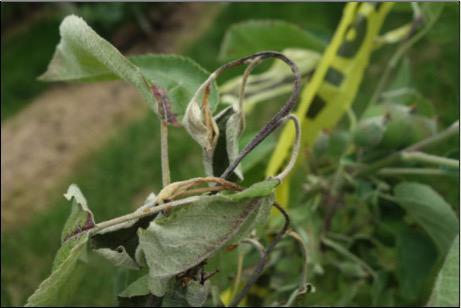 Fire blight has been reported in all major apple growing regions in the United States. In addition to apples, fire blight can occur on more than 75 species of trees and shrubs including pear, quince, cotoneaster, hawthorn, serviceberry, and crabapple. Fire blight is caused by the bacterium Erwinia amylovora. 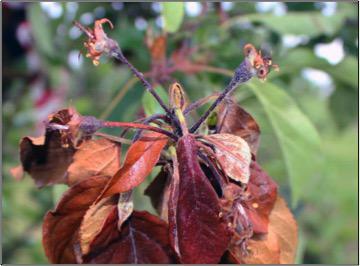 Blossom blight: An infected blossom will often appear "normal" or healthy through petal fall. Approximately one to two weeks after petal fall wilting may be evident on infected blossoms. Depending on cultivar, pedicels may take on an orange color. Under warm and humid conditions, bacterial ooze may be produced on the outside of the blossom. Over time, young fruitlets will blacken and are more difficult to remove from the tree than non-infected fruitlets. Shoot blight: The tip of infected shoots bends to resemble a shepherd's crook. Leaf mid-veins and pedicels blacken and eventually the entire shoot wilts and turns black as bacteria migrate through vascular tissue. Progression of symptoms occurs from the shoot tip toward larger scaffold branches or the scion. Under warm and humid conditions ooze may be present. Cankers often develop where current year's shoot growth meets older wood. Rootstock blight: Rootstock blight occurs when E. amylovora originating from blossom or shoot infections migrate down to susceptible rootstocks and form a canker that can girdle and ultimately kill a tree. 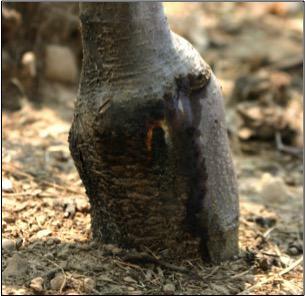 The above-ground portion of the rootstock turns black and under humid conditions bacterial ooze might be present. Due to water restriction caused by the girdling, leaves often take on a reddish color and wilting is apparent. Symptoms of rootstock blight are usually observed in the late summer / early fall. Canker blight: In simplest terms, a canker is a dead section of bark / underlying wood on branches or main trunks of trees. In reference to fire blight, the pathogen overwinters in cankers that were established as a result of infection the previous season. Early symptoms of canker blight include water soaked zones in healthy bark tissue that borders active cankers. Within days, bacteria colonize vegetative shoots that are in close proximity to the cankers and cause them to wilt and die. 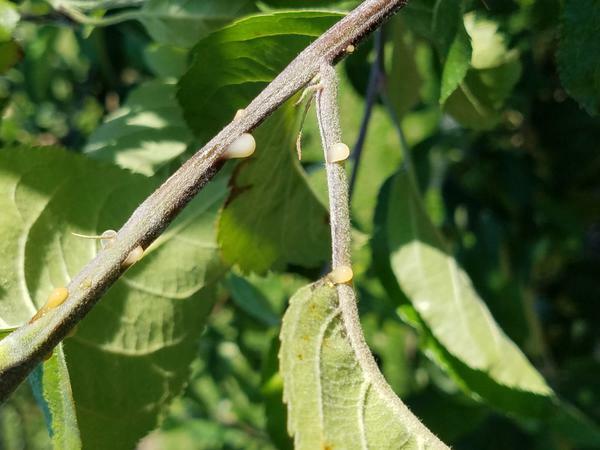 If not managed, oozing cankers can provide on-site sources of inoculum for fire blight epidemics. Shepherd's crook and mid-vein blackening on 'Gala' shoot infected by E. amylovora. Bacterial ooze resulting from a blossom blight infection on 'Rome Beauty.'. Ooze on a rootstock infected by E. amylovora. Fire blight canker on 'Rome Beauty.'. 'Rome Beauty' with several fire blight strikes. Erwinia amylovora overwinters in the margins of cankers formed on fire blight infected branches, trunks, or shoots during the previous season. Warm weather (~65°F) and precipitation during the spring will cause the pathogen to rapidly multiply within cankers and subsequently exude onto the tree bark ("bacterial ooze"), which will provide inoculum for infections during the current growing season. The bacterial ooze is dispersed to open blossoms through casual insect movement (predominantly flies), rain splash, and wind. Following colonization of E. amylovora on the stigmatic surface of the blossom, multiplication of the pathogen on the stigma of flowers occurs under warm temperature/high humidity conditions. Pollinators carry the bacterial pathogen from flower to flower, thus setting up the stage for numerous points of infection throughout an orchard. During wetting events, including precipitation, heavy dew, or even a pesticide application, the bacteria wash from the stigmatic surface into nectarthodes, and a blossom infection is initiated. Infection by E. amylovora can progress from blossoms into woody tissue, including limbs and supporting scaffold branches. An alternative route to the shoot blight stage of the disease is through the direct infection of the youngest 3 to 4 leaves on a vegetative shoot, often by activity of insects with sucking or piercing mouthparts. 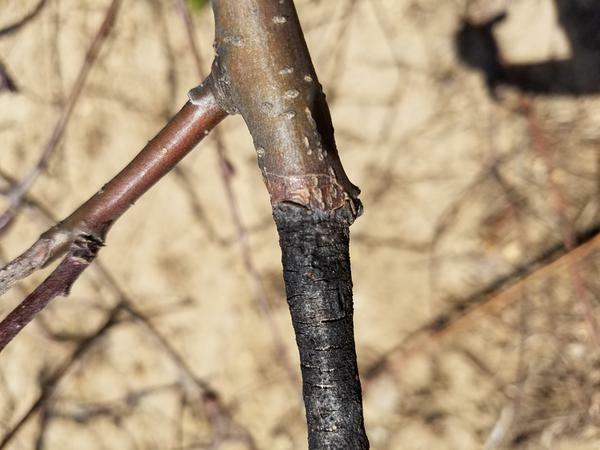 However if fire blight is already present in the orchard, wounds by external forces such as wind-blown soil or hail in young leaves can also leave the tree vulnerable for fire blight infection. Disease forecasting models, such as Maryblyt (University of Maryland) and Cougar Blight (Washington State University) are used to predict blossom blight infection events. 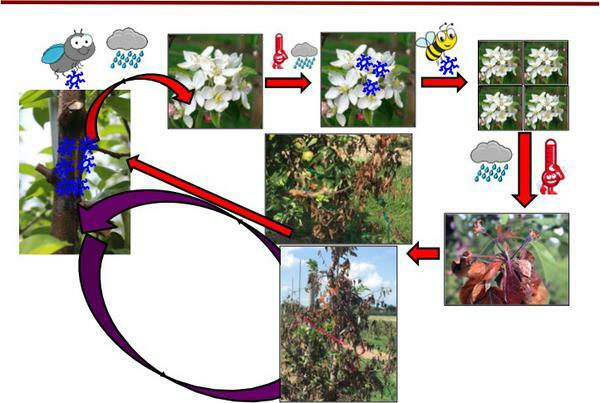 Both models incorporate host phenology, past, and future weather conditions to determine the likelihood and severity of a blossom infection by E. amylovora. A user friendly interface for predicting blossom blight infections that incorporates logic from both of the aforementioned models can be found at: newa.cornell.edu. In conventional management systems, antibiotic applications such as streptomycin, and to a lesser extent kasugamycin and oxytetracycline, are considered the standard for blossom blight control. Applications should be made preventatively in accordance with forecasting models during bloom. Remember that any open blossom will continue to be susceptible to fire blight as long as it has intact petals. The table below lists active ingredients/products that are registered for blossom blight in North Carolina. In addition to antibiotics, the list also includes coppers, biological products, and systemic acquired resistance inducers (SAR). While these products do not usually perform as well in field trials conducted at NC State, they may provide full control against blossom blight under low disease pressure. Also keep in mind that copper applied after green tip may result in phytotoxicity (see photo below) to fruit and/or foliage. Table 1. Example commerical bactericides for blossom blight control. Active Ingredient Example Formulated Product Bactericide Description Pre-Harvest Interval (days) FRAC Code OMRI-Listed? 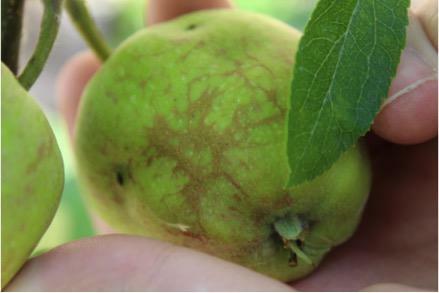 To mitigate risk for resistance development, antibiotics are not recommended for management of shoot blight in apple. As a result, chemical management options for this stage of the disease are still relatively limited. In research trials and in commercial orchards the plant growth regulator, prohexadione calcium, has demonstrated exceptional efficacy in minimizing shoot blight infections. Prohexadione calcium prevents shoot blight infection by 1) reducing vigor (shoot elongation) of terminal branches thus minimizing the amount of susceptible leaf tissue and 2) By thickening xylem cell walls to a point in which it forms a physical barrier from the bacteria. Other options for shoot blight control include SAR inducers and biological compounds, however similar with blossom blight, the efficacy of these products is generally not as good for shoot blight control as prohexadione calcium. 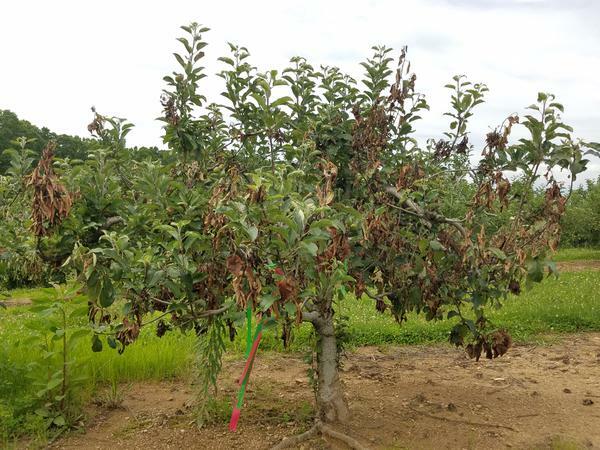 Post-green tip rates of copper can also be effective against shoot blight, but their use should be limited to young, non-bearing orchards due to the risk of phytotoxcity on fruit. Table 2. Example commercial products for shoot blight control. Active Ingredient Example Formulated Product Product Description Pre-Harvest Interval (days) FRAC Code OMRI-Listed? High rates of copper applied prior to green tip is recommended for managing canker blight. Because copper applied after green tip greatly increase the risk of phytotoxicity, high rates of copper are applied prior to this phytotoxicity window with the goal of residues remain on the tree when the pathogen begins to ooze from cankers as bloom approaches. The coppers listed above for blossom and shoot blight management are also labeled for canker blight management. Be sure to follow the label directions regarding application rate. The removal of blighted shoots or whole trees if the pathogen has reached the scion (trunk) should be part of any sanitation program. For best results, blighted shoots/branches should be pruned into last year's growth or at least 12 inches below the last visible sign of necrosis. All prunings should be removed from the orchard and destroyed. When removing fire blight, be sure to prune on the driest / coolest days possible (e.g. during winter). There are some differences in susceptibility to Erwinia amylovora across apple cultivars. Popular cultivars in North Carolina including 'Gala' and 'Pink Lady' tend to be highly susceptible whereas 'Red Delicious' is considered less susceptible to the disease. There are several fire blight resistant rootstocks including those in the Geneva (G-) series. Russeting on fruit resulting from copper application.